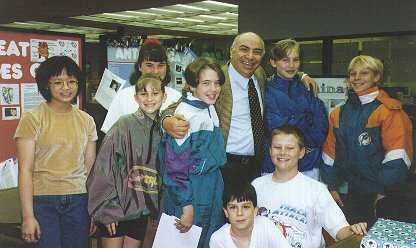 Friday morning, May 2, Delmar 5th and 6th graders hurried to the Media Center and the Delmar KIDLINK lab to see their "adopted" Italian grandfather - Papa Carmelo. Their on-line mentor travelled all the way from Perugia, Italy to visit the young students who have been writing to him on the Internet. 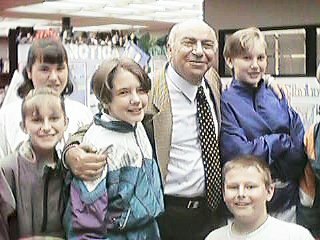 While he has been teaching them about Italian money and Italian history, they have been helping him learn English. Papa Carmelo was also very happy to see the younger 1st, 2nd and 3rd graders who showed him in their letters that they know their plurals. Math was a harder subject and Papa helped the younger students with regrouping. For several weeks before Papa Carmelo arrived the students made a "Delmar Dictionary" of A, B, C words that are Eastern Shore words. "A" is for Assateague. "B" is for our Chesapeake Bay, etc. They drew pictures of the words and presented Papa Carmelo with his gift while he gave them a gift of four children's books in Italian! The books are fairy tales, the story of Ulysses and a children's encyclopedia. These are beautiful treasures! While in Maryland Papa Carmelo needed his raincoat for sure just as the children predicted. The rain ended Saturday afternoon and he visited the Pow Wow in Crisfield. On Sunday he toured the Ward Wildfowl Museum and the beaches of Ocean City and Assateague Island. He enjoyed several meals at LaRoma Restaurant with owner Vinnie Belia who is also from Sicily, where Papa Carmelo was born. Carmelo and Vinnie had a good time talking in Italian. On Friday evening Papa Carmelo attended the James M. Bennett Grand March and saw Mrs. Weeg's son and daughter dressed in their Prom attire. This was a visit with many new adventures for Papa Carmelo! Enjoy these images of Papa Carmelo and the students during his visit to Delmar. Look at his new friend!